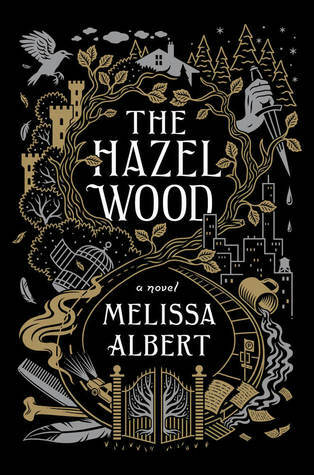 The Hazel Wood by Melissa Albert. Flatiron Books, 2018. Hardcover. 368 pages. This review has taken me so long to write because I have no idea how to fully describe this book. 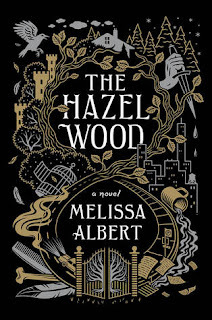 The Hazel Wood is one of those books that I was really impressed by and found the overall concept and plot wonderful, but I still feel like there was something missing even though I really enjoyed it. Going into this book, I was really excited. I love fairy tales and stories that revolve around the idea of how they function, especially if they are on the darker side. The Hazel Wood does exactly that with its own version of 'fairy tales' known as Tales from the Hinterland that were written by our protagonist, Alice's, grandmother. As a child, Alice was never allowed to talk about or even read any of her grandmother's stories, and in fact Alice is now extremely rare. The beginning of this book is a bit slow. There isn't much in the way of fairytales and magic in the first half, other than vague discussion of Alice's grandmother's tales. There is more of a focus on Alice and her mother's lifestyle and her personal life. It wasn't that the beginning was boring, but it just felt like a lot of build-up for the second half of the book, which ended up feeling like there was a lot filled into a small space. As The Hazel Wood progressed, it seemed to teeter on a very precarious ledge where it could either turn into something really boring and poorly executed, or truly magical. I was so pleasantly surprised to find the latter was the case. The Hazel Wood was even more incredible than I expected. Albert took this idea and turned it into something truly brilliant that I find to be fairly rare in these types fairytale-inspired tales. There was such a fantastic mix of magical, creepy, dark, and unpredictable that I really enjoyed. The way Albert turned the idea of fairytales and an alternate land--the Hinterland--into something really unique and intricate was so interesting. She played with time and stories in a very interesting way that I really enjoyed reading about. I know that sounds super vague, but I don't want to give anything away! I have mixed feelings about the character of Alice. She's not exactly likable, but she's interesting. I found myself curious about what she would do in the story, but I wasn't really invested in her life or actions. I did, however, find Ellery Finch, a boy she befriends from her school, much more fascinating. I almost wish that we would get some sort of extra story about his own background and upbringing, as well as what continues to happen with him. He just felt so much more complex than Alice and I was actually invested and interested in everything he said and did. This frustrated me a little, but I did still very much enjoy the novel. Alice's mother felt like that 'literary novel mother' that I see so often: a bit flighty, unpredictable, dramatic, over-the-top in her emotions and reactions... it's not necessarily a bad thing, it just felt like stuff that I had seen before. Nonetheless, she was still an interesting character that did add quite a bit to the story. One thing that I can say I also really liked was Albert's writing. At times, her writing felt very ordinary and didn't stand out much, but there were so many instances in which her prose simply glowed. She had a magical way of phrasing things at times, ways that were often dark and slightly bleak, but sound so lovely and captivating. Overall, I've given The Hazel Wood four-and-a-half stars! Despite any issues I had with characters and storytelling, I was still incredibly entranced by the Hinterland and the story Albert built and would certainly recommend this to anyone looking for a dark, magical story.